Beautiful 3 beds, 2 baths, penthouse with air-conditioning in Vila Sol Village with superb elevated views over pine trees and down to the sea. The spacious apartment has cool terracotta floors throughout, the lounge has a high pitched ceiling and open fire with new 42' flat screen TV, DVD & stereo, while the large kitchen is fully equipped with cooker, fridge/freezer, microwave, dishwasher, w/machine and tumble dryer. All 3 bedrooms (1 en-suite) have 2 single beds. Patio doors open onto the huge balcony, overlooking extensive gardens, with rolling lawns, mature trees, 3 pools, Jacuzzi and poolside bar/café. At the village entrance is the shopping area with supermarket, deli, Oscars bar and restaurants. The 5 * Pestana Vila Sol Hotel, Golf course, tennis centre are also on the resort. Lovely Vilamoura marina is 5 min by car and Quinto do Lago/Vale do Lobo, with their beautiful beaches and golf courses are only a few minutes away. Vila Sol Resort: The apartment is situated within the beautifully landscaped village area, with it's rolling manicured lawns, flowering borders, palms and umbrella pines. You can relax around the 3 main pools, 2 children pools and jacuzzi and enjoy drinks and a meal from the café/bar area. Situated at entrance to the village is the shopping area which has a wine bar/tapas, Oscars traditional pub, restaurants, deli, small convenience store, tobacconist, etc. Minutes away is the excellent golf course and clubhouse adjacent to the brand new 5 star Vila Sol hotel with all it's amenities including pools, tennis centre, bars and lakeside restaurants with views across the golf course. Beautiful beaches are less than 10 mins away and here you can participate in a number of water sport activities or simply take it easy. 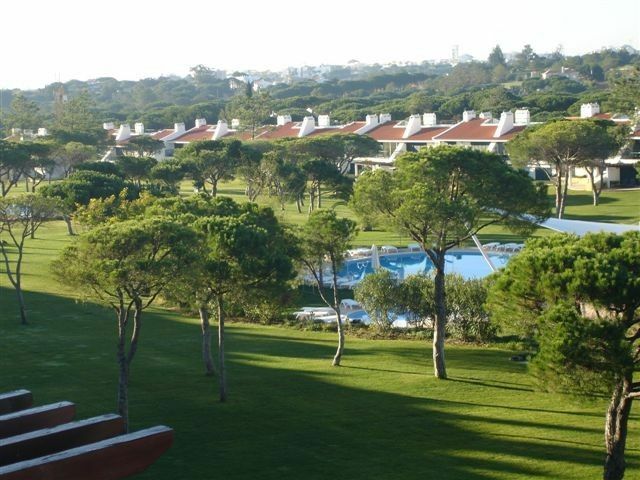 Vilamoura: Vilamoura is a couple of minutes drive from the apartment and is totally geared to your holiday enjoyment. Here you can participate in or watch almost any sport you wish or simply relax at one of Europe's largest and most exciting marina's. There are year round activities such as amateur and professional golf tournaments, international sailing regattas, shark and marlin fishing, tennis and international bowls competitions. There is even an equestrian centre which hosts an annual international show jumping festival !! But unquestionably the hub of Vilamoura is the beautiful marina, which is surrounded by superb shops, affordable local and international restaurants and quayside cafés, banks, supermarkets, a cinema, day and night bars and a jazz club. You can also charter a boat and cruise along the coast, or sunbathe on the beautiful sandy beaches situated either side of the marina entrance. These blue flag beaches are recognised as amongst the cleanest in the world. Local weather: The Algarve boasts over 300 days of sun per annum and even on the hottest day a gentle sea breeze can make the temperatures bearable. The temperate climate means that the warm sun can be enjoyed year round, ideal for an early or late break. With miles of sandy beaches, a myriad of water sports, numerous excellent golf courses, water parks, a new shopping mall, traditional street markets, casinos, a marina surrounded by fashionable shops and restaurants, superb fish restaurants serving everything from freshly caught sea bass to sardines and washed down with some chilled local wine, all in the sunniest climate in Europe this could be the perfect location. No smoking inside the apartment. Please use the balcony if you wish to smoke. As with all balcony and terrace areas, please take extra care particularly with young children and do not leave them unattended ! Maid service is 3 times a week. Please contact us for special rates on longer stays or weekend breaks. We had a great holiday, staying in this lovely apartment. It's by far the most spacious we have visited and certainly in the best condition. The communication with Sue was great. She was always quick to respond and very helpful. The Vila Sol complex is fantastic with just the right amount of shops and restaurants within walking distance. The Tapas bar is a must! The three pools are all very clean and well cared for, as are the grounds as a whole. We didn't hire a car and you can survive without, but if we return (which we will) we'll hire to venture further afield! This is the second time we have stayed in this apartment. Excellent facilities and a great location for a holiday. Well maintained and very comfortable. I have recommended this accommodation to others. Five minutes from the local waterpark and 10 minutes from the Marina. Lots to do and see and ideal for kids with a choice of pools in the gardens. Great apartment in a great location!! Had a wonderful time in a great apartment! It had everything we needed and more well decorated and loads of space! Lovely spacious balcony area overlooking beautiful gardens and pool area which is very well maintained!! Definitely recommend this apartment hope to be back very soon! Thanks!! Lovely spacious and comfortable apartment with good facilities. We had a lovely holiday, ideally located although a car is a definite advantage to take advantage of exploring the area. There are local restaurants and a lovely café which served very good wine in easy walking distance. The pools and their surrounding area were clean and well served with facilities. We enjoyed our stay and sitting on the balcony in the evenings - very hot in the afternoon however. The apartment at Vila Sol was ideal for us with parents and our own child. Having three bedrooms the accommodation was more than enough for all of us and with the added bonus of three bathrooms (two bathrooms, one toilet). The complex the apartment is on is very safe, perfect when travelling with an adventurous 2 nearly 3 year old with key fobs needed to access pool area and to exit. The variety of places to eat on site was brilliant, something for every taste and other recommendations were also great, a day at the beach and a visit to BJ's is a must. The use of the local golf facilities helped to keep my partner and my father busy while the ladies enjoyed the sun. All local golf courses are of a very high standard and the shopping at Algarve Shoppong is fabulous. All in all a great holiday, we will be back next year! Great location and good facilities. Three pools, good restaurants, waterpark and beaches close by. Relaxing holiday. Thanks for your nice review and we are glad you enjoyed your stay. Note for prospective renters: The guest has tried to correct the one star rating (was meant to be 5) by sending an email to Homeaway. We have also contacted Homeaway but the rating has not been amended as yet. Sorry for the confusion with the rating and the review. The village is part of the 5 star Vila Sol Golf Resort & Spa situated within the 'Golden Triangle' of Quinta Do Lago, Vale Do Lobo and Vilamoura and is just 20 mn from Faro Int'l airport. The town of Quartieira with it's beach side restaurants, bars and famous fish market is only a couple of minutes drive as is Vilamoura Marina. The beautiful marina has more than it's fair share of superb restaurants and bars to suit every taste. About 15 mn further west is the lively Albufeira resort which is definitely worth a visit for a fun day/night out. All along the coast are superb sandy beaches and quiet coves to explore. You are spoilt for choice! Apart from the marvellous golf and tennis facilities, there are water sports, cruises, sailing, fishing, horse riding, bowls, etc all available locally and the kids will love the water park which is less than 5 minutes away! For further details, information and photos of the complex, please contact us. Golf: The Algarve is home to some fabulous golf courses and the apartment is adjacent to the Vila Sol course, a few minutes walk from the clubhouse. This superb course has twice hosted the Portuguese Open as well as the Lancome Trophy and Johnnie Walker Classic. It has challenging undulating holes which meander through an old pine forest, with water and fast greens to negotiate. A lovely clubhouse overlooks the 18th green, where you can enjoy a well earned drink and meal ! Within a few minutes drive are the Vilamoura courses, featuring The Old Course, Pinhal, Laguna, Millenium and the latest addition The Victoria, designed by Arnold Palmer. Again, these are all excellent courses with great facilities. Probably some of the most famous courses in the area lie about 10 -15 mn east of the apartment. These are The Royal and Ocean at Vale do Lobo, Quinta North and South at Quinta do Lago and also Pinheiros Altos and the famous San Lorenzo course. There are even more courses further East and West including Henry Cotton's favourite 'Penina' near Alvor. This really is a golfer's paradise !! If you require any information regarding booking tee times and discounts, please do not hesitate to contact us. Please note: a 20% non refundable deposit is required to confirm reservation. A further deposit of £100, in the event of damage and breakage’s is required prior to travel, refundable on return.